On February 9th, 2018 the American space research agency NASA announced that their space shuttle New Horizons spacecraft took the farthest photograph from earth. This is a new record in the history of science and photography. The previous record for the most distant image captured on camera belongs to the “Pale Blue Dot” the famous photograph captured by Voyager 1 in the year 1990 on Valentine’s day. Photographs of 2012 HE85 and KBOs 2012 HZ84 (right) taken by New Horizons spacecraft. 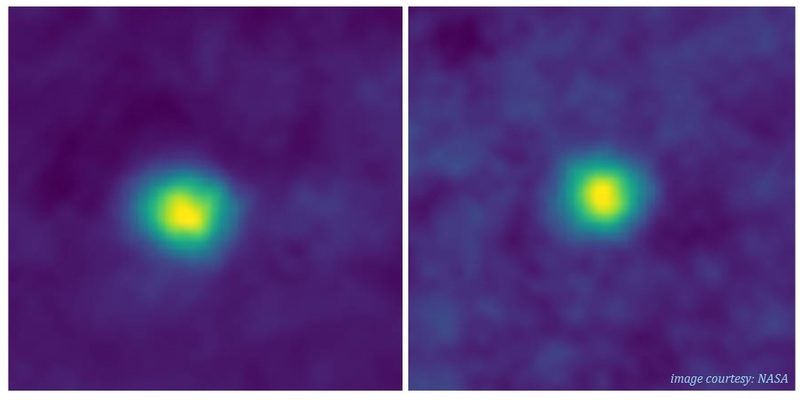 These are the closest pictures of Kuiper belt objects evert taken. Kuiper belt is a region in the outermost area of our solar system which is similar to an astroid belt, but nearly 20 times larger in width and 200 times larger in size. Pale blue dot is an image of earth from the farthest distance whereas the new images are pictures of objects in Kuiper Belt. Pale blue dot was captured by Voyager 1 spacecraft. The Kuiper belt images are taken by New Horizon spacecraft. New Horizon is the same spacecraft that took the closest picture of Pluto in 2015. Pale Blue Dot remained the most distant photograph and its record was undisputed until these new photos were taken in December 2017. The image pale blue dot was the result of a photography technique known as composite photography were 60 different images were used to create it. Soon after the Pale Blue Dot was captured, the camera on Voyager 1 was shut down. The New Horizon spacecraft, however, is expected to capture more images of the outermost area of our solar system. According to NASA on January 1st, 2019 the New Horizon will encounter with 2014 MU69 which is a Kuiper Belt object that is 1 billion miles away from Pluto! Do you know that the spacecraft New Horizon covers a distance of 1.1 million kilometers (700,000 miles) each day?